You are here: Home / Ethnic Groups / The People of Sumatra / Who are the Musi? 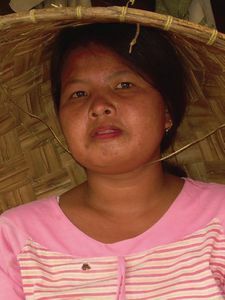 The Musi people live along the Musi river in South Sumatra, which is also where they get their name. There are also many Musi people living in Palembang who tend to live in groups together with other Musi people. The Musi Rawas Regency is a very isolated area as the roads are not good from Sekayu or Lubuk Linggau. The means of livelihood among the Musi is often strenuous work including farming, hunting, and fishing. They also work in a variety of other fields such as forestry, construction, and education. Those living in Palembang work as land developers, shipyard workers, and rickshaw drivers. Many of their traditional raised platform houses are being replaced with modern style homes. This is happening for many reasons, one being that the wood materials for the raised platform are difficult to maintain. In Musi culture, a young engaged woman becomes the responsibility of her fiancé. He must pay for all of her needs except food which is still her parents’ responsibility. The Musi use the patrilineal system for their line of descent. Within the family, the husband is responsible for making a living and protecting his family. The wife’s responsibilities are to take care of the tidiness and harmony of the home so that the husband can say, “My home is my heaven.” Within the Musi Sekayu families male children are preferred because they are perceived as a guarantee for the country’s future as well as guaranteeing the continuation of their hereditary line. Almost all of the Musi follow Islam. Building a house of worship other than a mosque is not allowed in the Musi area by the local government. The Musi have two opinions concerning changing one’s religion. The first opinion is that changing one’s religion is not allowed by a Musi Muslim for any reason. The other opinion is that changing one’s religion is an individual right, so it would not be a problem for a person to change. Marriage between people of different religions is also not allowed. The non-Muslim partner must change his or her religion to Islam. If one of the partners does not want to change their religion then the marriage is considered invalid. Musi people are Muslim because their ancestors were Muslim. They follow the Islamic religion because it has been passed down to them and is a part of their culture, not because they understand it or have faith in it. Because of this, religious worship is not an important factor in their lives but rather, it is a part of their identity. Musi livelihood consists of only small rice and rubber crops. Rice can only be planted and harvested once a year even though the average Musi person lives along the Musi River. The Musi River is a very large river that empties into all of the other rivers in South Sumatra. Because of their dependence on rice as their livelihood, the Musi people need irrigation technology so they can make use of the river water for irrigating their rice farms in order to have two or three harvests a year.